Bank United Center in Coral Gables, Fla. The 41st event from Titan Fighting Championship features quite a few noteworthy prospects. 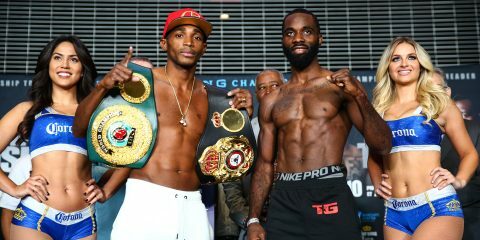 Undefeated featherweight Andre Harrison is set to defend his featherweight crown against Alexandre Bezerra in an intriguing co-headliner, and fans will get to see undefeated upstarts Demarques Jackson and Caio Rocha in action in separate bouts. Meanwhile, the evening’s headliner might turn into a UFC audition for Kalindra Faria, who clashes with veteran Carina Damm for Titan’s inaugural women’s bantamweight strap. The 30-year-old Faria is taking the long road to the UFC. The Brazilian rose to prominence as a flyweight, but she shifted her focus to the strawweight division and started to climb toward the big leagues. She actually made it as far as a title fight with Jessica Aguilar under the World Series of Fighting banner, but she couldn’t unseat the champion. Her next fight, which took place in Poland’s KSW promotion, was a split decision loss to Karolina Kowalkiewicz, who catapulted to the UFC with the victory. 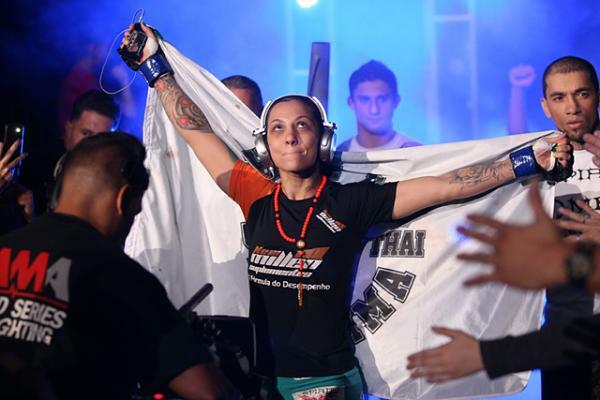 Faria, meanwhile, had her Legacy FC debut bout with Valentina Shevchenko scrapped and then returned to Brazil to snag two victories over overmatched opponents on the regional circuit. Now, she returns to U.S. soil at 135 pounds in another attempt to find a path to the Octagon. The Bronx’s Gold Team member has seven wins by some form of knockout and five submission victories. She’s fought a number of top-tier opponents beyond the aforementioned Aguilar and Kowalkiewicz. The Brazilian’s other losses came to Vanessa Porto, Claudia Gadelha and her current opponent, Damm. She fought to a draw with Jennifer Maia and has defeated the likes of the aforementioned Damm, Aline Serio (twice) and 8-2 prospect Laura Balin. Damm is a well-traveled veteran who has struggled to find consistency. The 37-year-old, who debuted in 2004, did have a string of 10 consecutive victories from 2007 to 2010, but she’s suffered numerous setbacks ever since. Damm, like Faria, has been in action against some of the best in the business while competing primarily at flyweight and bantamweight. She has notched wins over the aforementioned Porto, Aguilar, Serio and current opponent, Faria, as well as Miku Matsumoto. She’s also lost to Matsumoto, Faria, Rosi Sexton, Hitomi Akano, Cat Zingano, Tara LaRosa, Munah Holland, Tonya Evinger, Jessica Eye and Elaine Albuquerque. Her most recent loss, however, came against Marciea Allen, whose record stood at just 3-2 entering the contest. Damm has seven wins by knockout or TKO and 10 victories via submission. Her most notable stat, however, might come in the loss column. She has been submitted six times. 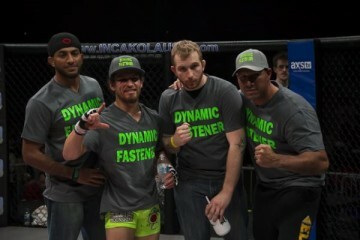 Damm has spent time at elite camps, including American Top Team and Alliance MMA. Damm’s best days are far behind her. Since her 10-fight winning streak came to an end in 2010, the Brazilian has posted an underwhelming 8-8 mark and hasn’t won more than four fights in a row. Faria, who had previously fallen to Damm during that streak by way of a second-round TKO, was able to submit Damm with a first-round armbar. Many of Damm’s recent victories, with the exception of her Titan FC win over Sarah Alpar, came against fighters who were coming into the contest with only their pro debut under their belt. Every time she stepped back up to fight truly seasoned opponents during this stretch, she lost. Faria’s a fighter on the verge. She’s toiled around from promotion to promotion since making her debut in 2009, but she has an excellent chance to put up an impressive performance on a national stage via UFC Fight Pass. Her placement at the top of a card broadcast on the UFC’s platform also makes her a prime candidate to be signed to the UFC with a victory. However, her biggest hope has to be that the UFC will add a women’s flyweight division in the near future. Faria excels at 125 pounds, and that’s where she belongs. It looks like 135 might be the next best thing for her, though. Damm won’t provide much of an obstacle, either, if her recent performances are any indication. Faria was new to the sport when she lost to Damm. She was much improved the next time the pair met, and the result is proof. Damm’s in for another short night that ends with a tapout. 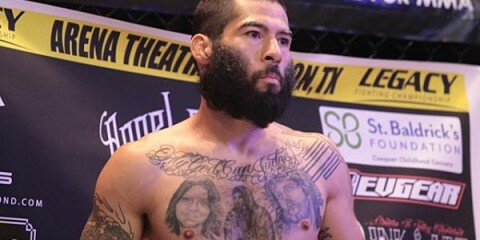 Titan has some competition for viewers on Friday night, and those viewers might opt to tune in to AXS TV for the 43rd offering from the Resurrection Fighting Alliance. 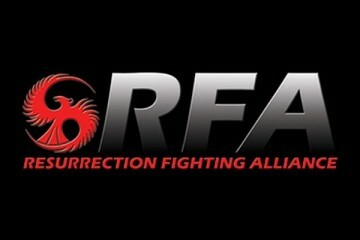 The RFA card might not include such eye-catching names as Kalindra Faria and Andre Harrison, but it certainly houses plenty of noteworthy prospects, including Adam Stroup, Gabriel Checco and Boston Salmon. 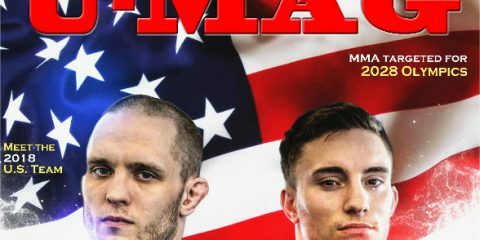 There’s also a title tilt featuring two more prospects at the top of the bill that pits Brian Camozzi against Nick Barnes for the promotion’s vacant welterweight strap. The Camozzi name should be familiar to fight fans. Brian’s brother, Chris, has become a staple of the UFC roster. Now, Brian hopes to follow in his older sibling. The 25-year-old Factory X Muay Thai export made his pro MMA debut in 2013. He has also competed in Muay Thai. His MMA career kicked off with two wins, but Camozzi stumbled in back-to-back fights to bring his record to an even 2-2. He turned things around in late 2014 and early 2015 to post consecutive victories. He sat on the sidelines for most of 2015 before returning to action in 2016 with another pair of victories to extend his current streak to four wins. Camozzi has scored finished in all six of his victories, but he has never been stopped. Und1sputed Boxing & MMA’s Barnes started his pro career in 2011. He appeared as part of Bellator’s Fight Master reality show in 2013. 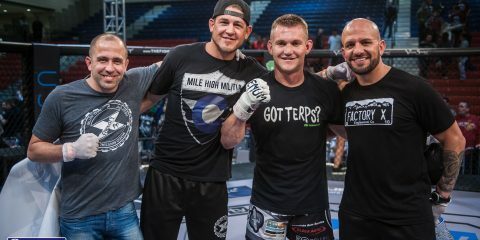 Barnes submitted Brendan Tierney and Tim Welch during the show before eventually losing by TKO to Cole Williams.He eventually did appear on a Bellator card in 2015 and scored what could be considered a mild upset of veteran James Terry. Barnes has also tallied decision wins over prospects Mike Jasper and Jose Diaz. His only loss came via submission against veteran journeyman and UFC castoff Jesse Taylor. Barnes has three wins by some form of knockout and six victories via submission. A decent showing on Fight Master, a win over Terry and only a loss to Taylor — these all seem to be big breaks on their own. Yet, here Barnes is, looking at what should be another break in the form of an RFA title bout. If he gets the job done, he might be Octagon-bound. If not, it’s yet another chance that has slipped through his fingers. Camozzi’s name value has undoubtedly contributed to his placement at the top of this card, but he’ll have to show that he can finish yet another prospect, and quite possibly the toughest prospect he’s ever faced. 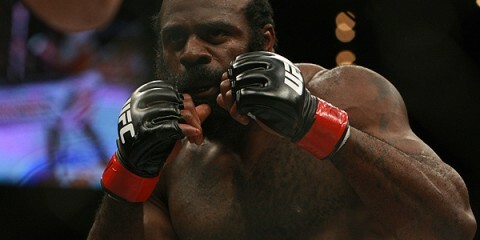 While the pro record of Barnes indicates only a submission loss, Barnes did also have the TKO defeat on Fight Master. This is a key detail for Camozzi, a striker with a decent ground game. Camozzi will have to keep the fight upright and hope to connect with strikes to put Barnes away. Barnes, meanwhile, would be wise to get the fight to the canvas and work from top position. Camozzi isn’t an easy out, so Barnes is going to have to earn points with the judges if he wants to emerge with the victory. This fight is likely to go the distance unless Camozzi scores a big knockout. Barnes is a finisher, but Camozzi is just too difficult to put away. However, Camozzi might struggle to neutralize Barnes on the mat. Barnes is the superior grappler, and he should be able to keep Camozzi on the defensive when the fight does land on the ground. Don’t be surprised if the judges are divided on the outcome in this fight, but the edge goes to Barnes. Pancrase returns with its 280th event this weekend. The show will air on what’s shaping up to be a busy weekend for UFC Fight Pass. The lineup features a number of tournament finals, but the main attraction is a lightweight King of Pancrase showdown between champion Kazuki Tokudome and challenger Takasuke Kume. 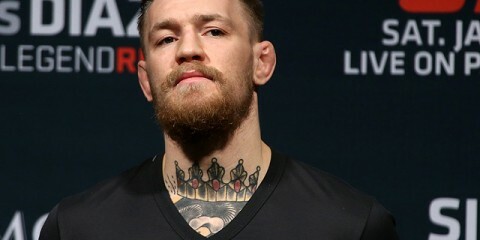 The 29-year-old champ has been on fire since a disappointing 1-3 stint with the UFC, where his only victory came in his Octagon debut against Cristiano Marcello. Prior to his UFC tenure, the judo black belt had gone 11-3-1 and suffered his most recent setback against super prospect Isao Kobayashi. However, he dropped three straight in the UFC to Norman Parke, Yui Chul Nam and Johnny Case. Following his departure from the UFC, Tokudome returned to Pancrase and scored wins over Yoshihiro Koyama and JJ Ambrose to earn a spot in a fight for the vacant Pancrase lightweight crown. Tokudome stopped Satoru Kitaoka with strikes in round four to capture the title and then added a win over fellow UFC castoff Akbarh Arreola in his next outing. The Paraestra Hachioji product is a southpaw fighter with eight wins by some form of knockout and three submission victories. He has been stopped by strikes twice and tapped twice. Kume is a 31-year-old fighter who has competed professionally since 2007. His career kicked off with an impressive 15-2-3 run. He hit on hard times recently, going just 3-3 over his last six fights. He lost twice to the aforementioned Nam and suffered a split decision loss to A Sol Kwon, but he has won his two most recent affairs. “Da Jaguar” is a grappler — he has 11 submission victories — who usually lands on the scorecards if he can’t get a tapout. Tokudome has been a veteran killer lately. He even stopped Koyama, Kitaoka and Arreola. The strength of record definitely leans in the champ’s favor, whereas Kume has had a few disappointing showings over his last six fights. Kume has never been finished, though, which could make this a tough night for Tokudome. The champ’s judo might be better utilized to keep the fight on the feet, where he can outwork his opponent en route to the scorecards. Kume is dangerous on the ground, but he hasn’t demonstrated finishing ability on the feet. If Kume can’t get this fight to the ground, he’s doomed to end up on the wrong end of the judges’ verdict.